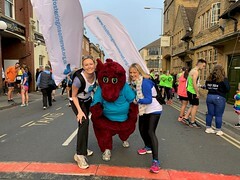 Trudi Grant, Somerset Director of Public Health, and ‘Sparky the dragon’ the Somerset County Council mascot had their flu jabs this week. They had their flu jabs on film to show people that it is quick and easy and to remind people that there is still time to get vaccinated. Trudi Grant, said: “I encourage everyone who is eligible for a free NHS flu vaccination to get it now. We know that cases of flu rise in January so it is best to protect yourself early. Here’s my top three reasons for getting the flu vaccination. “Firstly, the vaccination is the best protection we have against flu. “Secondly, flu is easily transmitted and even people with mild or no symptoms can infect others. “Thirdly, flu can cause severe illness and even death among those most ‘at risk’. These groups include pregnant women, people with a long-term health condition and older people. If you are not in one of the ‘at risk’ groups but want a flu jab you can still get one from a local pharmacy for a fee.